Every three years, the Programme for International Student Assessment, better known as PISA, evaluates 15 year-old students around the world to determine how well their education system has prepared them for life after compulsory schooling. Once the results are published, the media rush to compare their countries’ positions in the international league tables. Government policy makers, journalists and academic researchers mine the report to find out how successful education systems elicit the best performance from their students while making access to high-quality education more equitable. 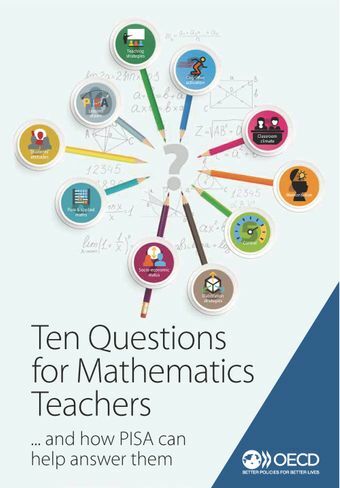 But sometimes the key messages don’t make it back to the teachers who are preparing their country’s students every day.Ten Questions for Mathematics Teachers… and How PISA Can Help Answer Them aims to change that. This report delves into topics such as, “How much should I encourage my students to be responsible for their own learning in mathematics?” or “As a mathematics teacher, how important is the relationship I have with my students?”. It gives teachers timely and relevant data and analyses that can help them reflect on their teaching strategies and how students learn. What can maths teachers learn from PISA?